The comedy centers on an introverted yet successful tech entrepreneur who hires the owner of Best Man Inc. to be the perfect best man and throw a killer wedding party. Directed by Jeremy Garelick (The Break-Up), The Wedding Ringer also stars Kaley Cuoco-Sweeting, Ken Howard, Cloris Leachman, Jenifer Lewis, Mimi Rogers and Olivia Thirlby. In the film, Doug Harris (Gad) is a loveable but socially awkward groom-to-be with a problem: he has no best man. With less than two weeks to go until he marries the girl of his dreams (Cuoco-Sweeting), Doug is referred to Jimmy Callahan (Hart), owner and CEO of Best Man, Inc., a company that provides flattering best men for socially challenged guys in need. What ensues is a hilarious wedding charade as they try to pull off the big con, and an unexpected budding bromance between Doug and his fake best man Jimmy. 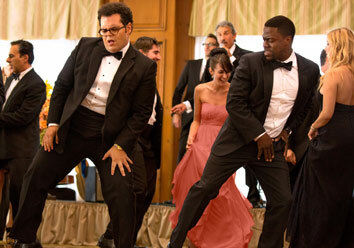 Opening across the Philippines in February 2015, The Wedding Ringer is distributed by Columbia Pictures, local office of Sony Pictures Releasing International.